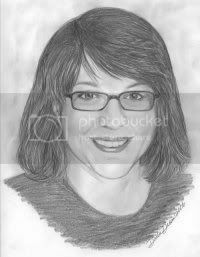 Two more lectures yesterday yielded two more portraits. 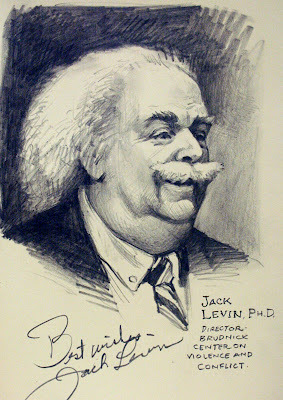 First was Jack Levin, Ph.D., a leader in the study of violence in the media. He started off his talk saying he is often mistaken for: Albert Einstein, Gene Shalit, David Crosby, Captain Kangaroo, Captain Krunch, Mr. Monopoly, Ben&Jerry, Mark Twain, Jerry Garcia, Juan Valdez (without the coffee), Grandpa Joe in Willy Wonka, Mr. Kotter (25 years later), Don King (with white skin), or even Beethoven. My sketch, made during his hour-long presentation, looks no more like him than anyone on that list does, because I rushed the layin stage, and spent all the time modulating the tones. I arbitrarily introduced the dark backgound to dramatize his white hair. Unlike Professor Levin, who had a great many rounded forms and soft edges, Mr. Kraft had strong planes and straight lines. There were three sources of light—window light from the left, and two fluorescents from the right. With such complex lighting, I knew the form wouldn’t carry with tonal modeling. So I kept the shading light and tried to concentrate on the subforms around his eyes and mouth. Amazing drawings, suprisingly subtle considering you probably had to do them quickly. Out of curiosity, what pencil do you use? Thanks, guys. I'm using mostly a 2B and 6B Faber Castell 9000. Because the Moleskine drawing paper is so smooth, I needed a pretty soft pencil to get good blacks. I had to watch smudging, especially on the one of Prof. Levin. Professor Levin does look a little bit like each of those people he mentioned, if someone just picks up on one feature! 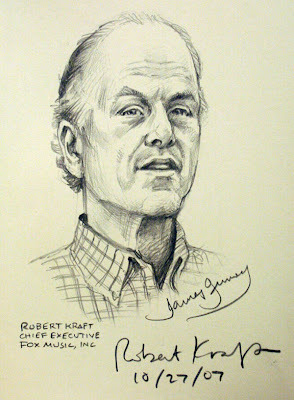 Robert Kraft does have very angular features, and I think he has some resemblance to Jack Nicholson, at least in this sketch.